On this page we will conduct Silent Auctions of various merchandise. We will run this page on the web and simultaneously on our shop second floor at 38 North Main St. in Mechanicville, NY. Generally, the time frame will span a two week period affording ample time for viewing. It will close at a prescribed time but if activity is still in progress on a particular item that silent auction will close five minutes after the last activity. To bid you must register a current credit card with proper name and address with our site (see below). You will then be issued a number and unique "bidder name" of your choice for use in bidding. A minimum bid amount will be given to all items, starting bids are that amount or higher. We will accept amounts of $1.00 increments for items under $50. and $5.00 for over $50. and up to $100. and then $10.00 for over $100. You must be the bidder as we will not have time to watch "left bid" amounts. Bids can be made in person at the shop, by phone or by e-mail (see below). Winning bidders will be posted on the web and immediately be known at the shop. Visit often and enjoy the auction. Again, to bid you must register. You never know what turns up. Unsold items are listed for sale below. We had our first silent auction and because of the time period we decided to concentrate on Christmas items, gifts and some collectable pieces that had accumulated around the store. Our intent now is to clear out the myriad amassment of shop things and move on to items of a collectable nature. In the interim we will do a combination of both. The first silent auction number was SA105. Lots 1 thru 64. Our second Silent Auction was SA106 which is closed. This Silent Auction is SA107 and we have the lots below. Some of the items not sold in SA106 are also included in this next auction. Lots 1 thru 47. Help us clear out the basement. To Bid Register Below. Some Unsold Items have been Moved to various pages on our site, others are below. Note: If no other bids are made on these items besides the minimum bid then the minimum bid will be the winning selling price. Click on thumbnail to enlarge. We will Post All Bids received on any item in chronological order and by "bidder name" daily at or about 7PM EST. To Bid Click on Minimum Bid ~ Register Info is Below. SA107 Lot 1 ~ Litton Butterfield Co., Athol, Massachusetts Set of Quarter Inch Metal Taps. One dozen brand new taps to the box. Bought as Military Surplus so you know they are of the best quality. 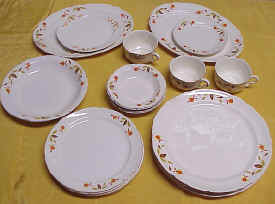 New, one set, minimum bid $10.00. SA107 Lot 2 ~ Five packages of new tools. One 10" Stanley SurForm replacement blade rasp and four Skill tools; two 1/4" and one 1/2" wood chisels and one 1 1/4" scraper. New, 5 packs, BUY NOW... $15.00. SA107 Lot 4 ~ This is a group of 26 dug relics of the stone age or rather prehistoric era. They are flint items from our American Indian ancestral past. All were found some years ago where the Hudson River and Hoosick River join in the upstate New York area. These appear to be mostly pieces of arrowheads or spear points or knife shards. They range in a variety of flint with some having mixed composition in the stone. These pieces are all representative of the flint chipping or working capabilities of man's early existence in this area. Most edges are still sharp and each piece is unique. The larger ones in the center are about three inches in length. View the close-up photos of each section by clicking your mouse. SA107 Lot 5 ~ Never know what turns up ... bleached 8" spread deer antlers and skull cap, three spinal column bones and 10 very nice teeth from a small carnivore, plus what looks like a raptor talon. I found these things years ago in various locales while "woods walking" in the Adirondack Mountains of New York. Another of my many "treasures" that have been lying around in boxes for years. BUY NOW ... $28.00. SA107 Lot 6 ~ Vintage Christmas Tree Cake tins, set of two. They measure about 10 1/4" high by 9 1/2" wide and are in overall fine condition. For the pair the BUY NOW ... $11.00. SA107 Lot 7 ~ Vintage three tier tin cake set. Each measures in descending size 9", 7" and 6" and all are in fine condition. BUY NOW ... $12.00. SA107 Lot 8 ~ Wilton Cake Decorating Kit, in two tier heart shape, complete with decorating bag and colors as new in original box. BUY NOW ... $10.00. SA107 Lot 12 ~ Decorative hanging birdhouse made in the design of a wood constructed "Bait Shop". Very cute design measuring 7 1/4" wide by 8 1/2" high, new condition. There are two pieces available buy one or both. BUY NOW ... $8.00. SA107 Lot 13 ~ W & R Berriss Company item No. 738 collectible, "Happiness is finding someone like you under my covers." Made in USA dated 1970, measures 3 1/2" wide by 6" high, appears to be made from a resin or something similar. BUY NOW ... $11.00. SA107 Lot 14 ~ Three piece Avon group, consists of "Revolutionary War Soldier" without candle insert; "Sparkling Swirl" glass, candle has been partially burned; "Casey at the Bat", shaving mug without contents. All with boxes, some box wear. BUY NOW ... $10.00. SA107 Lot 15 ~ Avon pair of collector figures. 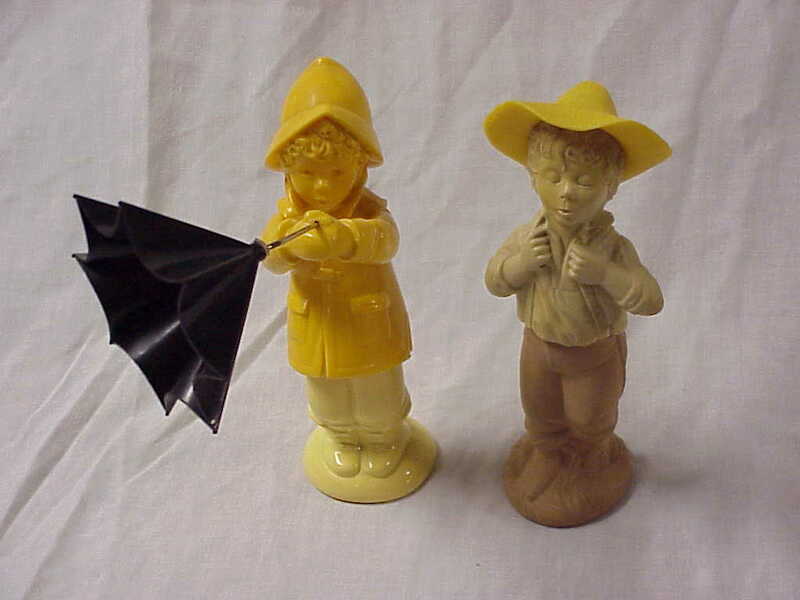 Moonwind cologne in "Tug A 'Brella," 8 1/2" tall. Sonnet cologne in "Catch-A-Fish" figure, but missing fishing rod. Both in excellent condition. BUY NOW ... $9.00. SA107 Lot 16 ~ Vintage, original box, c1940, all metal cake and sandwich (cookie) cutters. 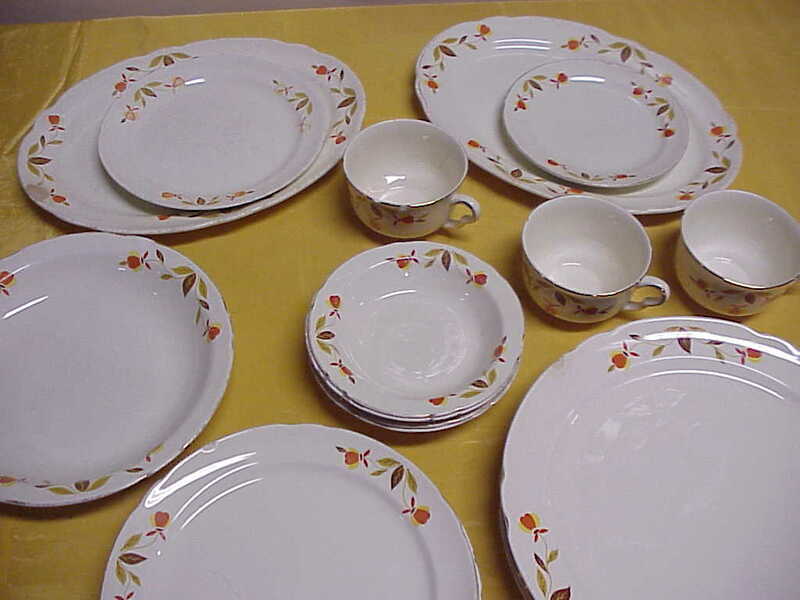 Made in England, "Tala", six piece set. Box states for "Bridge, Luncheon and all Party Occasions". For size reference the star measures 3" point to point. Cutters in as new condition, box shows age. A unique and interesting collectable. BUY NOW ... $35.00. SA107 Lot 17 ~ Lowrey's Beef 2nd series of Ducks Unlimited collectable tin. Approximately 7" tall and in as new condition except for slight ding in top edge. Complete with original paper work. A nice DU collectable. BUY NOW ...$6.00. SA107 Lot 18 ~ This great vintage cookie cutter in the shape of a rabbit is formed metal with riveted handle. The depth of cut is 3/8" and the height is about 3" by 4" length. In excellent condition. BUY NOW ... $8.00. SA107 Lot 23 ~ An item from the past, 1966 and in new original condition. A Kembric Cordless Electric Vacuum with accessories and paperwork. Operates on batteries, is lightweight and made in the USA, marked No. 222. BUY NOW ... $12.00. SA107 Lot 24 ~ Shop Vac Accessory, a 10" wet and dry nozzle for 1 1/4" hose or adaptor. In new condition, blister pack, made in USA, Williamsport, PA. BUY NOW ... $10.00. SA107 Lot 25 ~ Group of three team sports mugs. Patriots Glass Mug about 7" tall; the Buffalo Bills, 1988 AFL Champs, Betras Plastic Supermug; Glass Blue Devils mug. All three mugs for a BUY NOW ... $15.00. SA107 Lot 28 ~ The "Official Chex Party Mix Chef" apron featuring the Peanuts Gang in color. This is in new condition and is a standard size. This fine older advertising item has a BUY NOW ... $16.00. SA107 Lot 29 ~ Four advertising cook books consisting of Creative "Cooking with Velveeta," 1987, 33 pages. Favorite Recipes, "Quick and Easy Desserts," Borden, 1987, 33 pages. Favorite Recipes, "Great Tasting Chicken Recipes," 1987, 32 pages. Campbell's "Creative Cooking with Soup," 1987, 32 pages. For all four great books in new condition the BUY NOW ...$9.00. SA107 Lot 34 ~ Walt Disney Character Appliqués store counter card for retail sales. This is a card we once had in our Fabric Department and these appliqués were one of the best sellers. There are 16 individual characters in color which were Licensed by Walt Disney Productions to Streamline Products and made by Clover, NY. All made in the USA in the late 1970's. The card is in excellent condition and the appliques are in new condition. The BUY NOW ...on this unusual Disney item is $85.00. SA107 Lot 35 ~ The Walt Disney Company plastic cards, same size as credit cards, three different ones. A Starry Nights Card, Fairy Tale Princess Card and Spots of Fun Card all Mfg. by O. S. P. Publishing, Inc. CA. Housed in a soft plastic card file. All in fine condition. For all the BUY NOW ... $12.00. SA107 Lot 36 ~ Miss Cindy Puffy Stickers from 1983 by Laurie Import Ltd., NY. Four different packs in new condition blister packs, about 8" high. All four BUY NOW ... $12.00. SA107 Lot 37 ~ Group of play items including two Puffy Stickers of Cabbage Patch Dolls similar to company above, one Luminous Monster Sticker card, 1979 and one card with Hannah Jean Jeweled Eyeglass Cord by Greenbrier. All in new condition. BUY NOW ... $9.00. SA107 Lot 38 ~ Puffy Stickers from the 1980's consisting of two of same cards from the movie "Ghost Busters" and one of a young Barbra Streisand, "Yentl" all in new blister pack condition. BUY NOW ... $18.00. SA107 Lot 39 ~ GE Sunlamp Kit new in the original box from the 1970's and it works as new. Comes with a 275 watt bulb, the instruction brochure, adjustable holder and scissor clamp. BUY NOW ... $20.00. 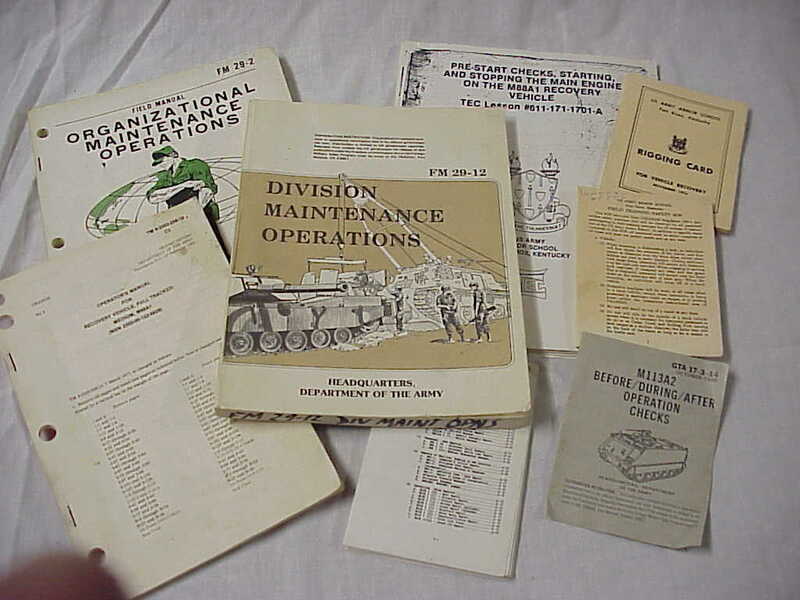 SA107 Lot 42 ~ Lot of 3 US Army Training Manuals consisting of Organizational Maintenance Operations FM29-2, 1975; Division Maint. Op., FM29-12, 1983; Operator's Manual for Recovery Vehicle M88A1, TM9-2350-258-10 C3, 1982; Pre-start Checks, M88A1; plus 4 misc. related manuals. All, BUY NOW ... $29.00. 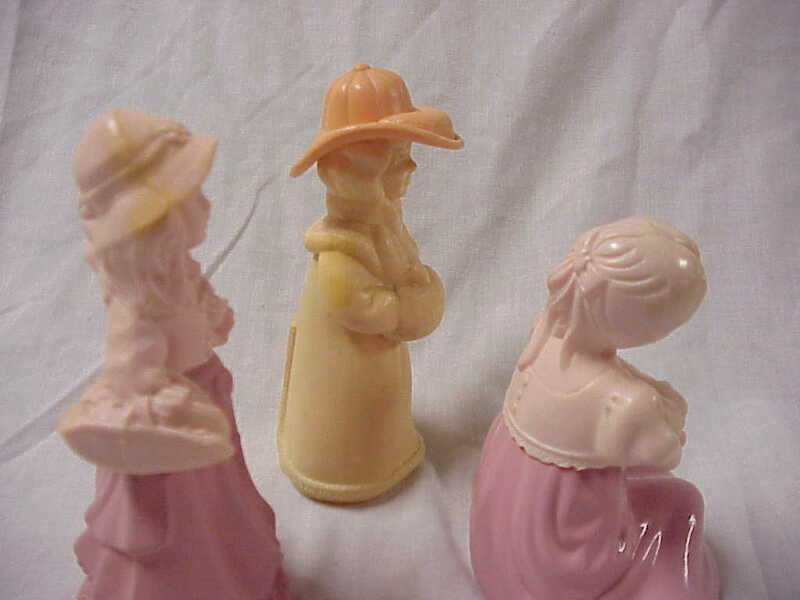 SA107 Lot 43 ~ Avon group of three Girls with cologne. "Dear Friends," about 6" tall, Roses, Roses cologne with contents; "Pretty Pink Girl" had Unforgettable cologne (some discoloration); "Little Kate," had Charisma cologne (has some discoloration) otherwise all in fine condition. All three, BUY NOW ... $12.00. SA107 Lot 44 ~ Avon pair of Presidents lot. 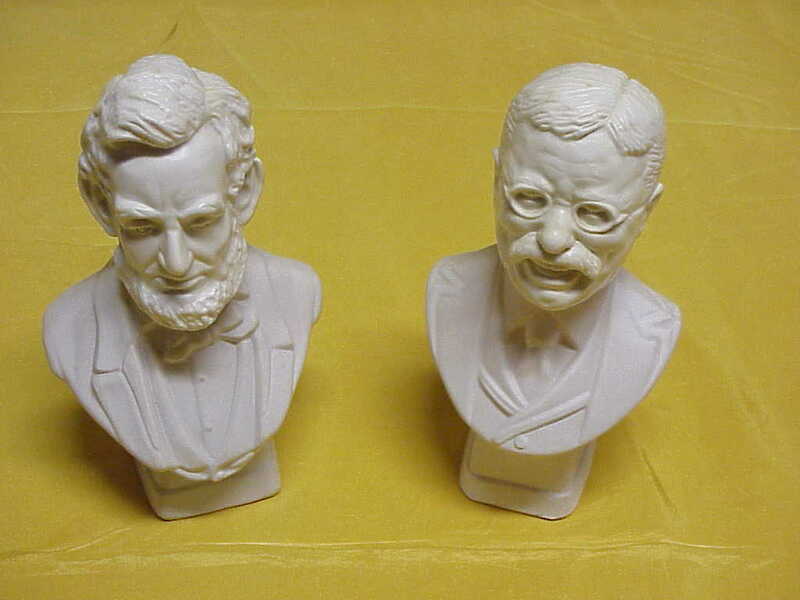 Abe Lincoln with Tai Winds after shave and Teddy Roosevelt with Wild Country after shave, both about 6 1/2" tall. Both are in fine condition and the BUY NOW ... is $9.00. SA107 Lot 45 ~ Anchor Ovenware, Micro Ware Brand fluted cake pan, 3 1/2 quart in original box with instruction book, all in new condition. Marked PM498/T1. BUY NOW ... $10.00. SA107 Lot 47 ~ Where else would you find about 50, 1 3/8" (standard size) glass lenses for old flashlights, and other flash light parts? Also a 1 1/2" smoke color glass lens. Would you believe you could probably sell each lens for $2.00 or more? They also fit most Winchester Flashlights. Well, here they are and for the lot I would like a BUY NOW ... of $29.00. To "BUY NOW" you need not Register. This is a very simple and uncomplicated silent auction page and we are a very reliable and honest company of real people in a real location. In our experience there are a multitude of con-artists and dishonest folks out there in TV Land that constantly try to, simply put, "screw" somebody for something. We have instituted some easy steps to eliminate many of the riff-raff and keep this page simple, fun and rewarding. If you can't follow the simple rules please don't involve yourself. Our reputation in our area and on the net is without question and our 100% guarantee for the items on our other pages and in our shop dealings has always defined our activity. See our auction guidelines below and please register with us. To register to bid on any of our NEACA.com Silent Auctions you will need to Contact Us by calling our shop at 518-664-9743 and register a credit card with your name and address which we will issue a $2.00 active charge to in order to verify it is a current card issued to you, the bidder, this is treated as a credit to your account at NEACA. This registration will be active for six months and then we will ask for upgrading for any new or current information, free. Or bring or send a $10.00 good faith deposit, which is a credit to your NEACA account, by check or MO to our shop or mail to PO Box 385, Mechanicville, NY 12118. If you are already a previous customer you can simply e-mail us at sales@neaca.com to update your intent to use a card we have on file or payment by check. Bidding is a contract between you and C & D Petronis, Inc. and is binding by the laws of New York State. A 7% sales tax will be added to the bid if you reside within the State or bid at our shop location. Shipping charges of $5.95 USPS Priority Mail will be added, heavier items can go UPS Ground with a $100. insurance credit for usually $12.00. Actual charges may be more. Multiple items can be grouped for shipment. We will also ship a "gift" to an address of your choice and gift wrap and insert a card for you for a small fee of $1.00. These items are sold at a discounted CASH price and the use of a credit card will void that discount of 3.5 % which will be added to the total bill in effect. However, we do accept good checks and money orders as cash. If you are a dealer in NYS you may send us a signed Tax Certificate. We try to describe items with accuracy but as with all auctions all sales are final. Enjoy the bargains and check our next Silent Auction.